Discussion in 'Elite Explorer 911!' started by 93XLTrusty, December 14, 2004. Ok so there is a snow storm outside and i was driving to a friend's place and decided to play in a parking lot on the way. When i tried to engage the 4x4 it wont work. I have a 93 XLT with push button transfer case and automatic locking hubs. I Just used the 4x4 successfully a few days ago, so I cant figure out why it wont engage now. I let my car warm up for about 5-10 mins before i drove it. I tried engaging 4x4 in every gear and still nothing. When I push the 4x4 button, i noticed my instrument panel lighting dims slightly for a scond, and the volt meter dips. I really need 4x4 to get around in this weather so HEEEELP PLEASE!!! So, is there a cheap fix for a frozen tranfer case motor? I read on another thread in here someone said you can get a friend to tap the motor with a hammer while you try to engage the transfer case. Does this work and where on the truck is this motor? Underneath behind the transmission is the transfer case. The shift motor is on the back of the transfer case. Shift motor problems are common on 1st Gen (91-94) Explorers... Tapping on the shift motor may help nudge it to work. The operative work is tap not beat to death... There are many threads on this topic so searching this board witll land many hits. Check out the shift motor link in my sig line to get you started. IMO the problem is partly design related and partly due to intermitant use. 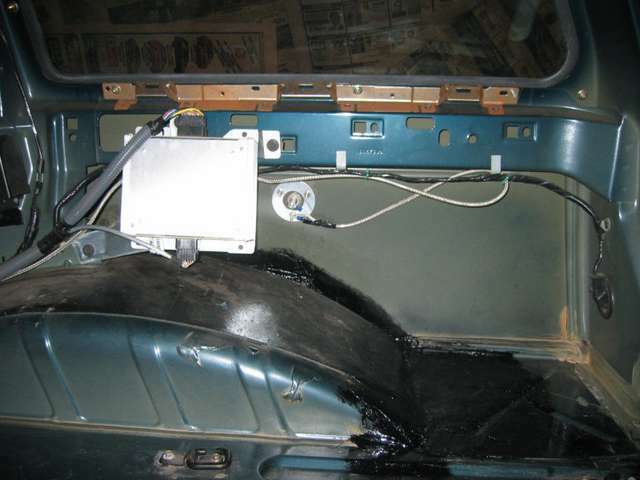 Lack of use tends to slowly freeze the motor into position until it draws too many amps and is shut down by the 4x4 controller in the trunk area. Once you get it working don't be stingy wtih 4x4 and engage it a few times a month to keep it in good working order. My explorer is having the same problem...push the buttons, but the orange lights do not come on. Does anyone have a picture or service manual illustration of what the shift motor looks like?? Before I go bashing things with a hammer I want to make sure it's the right part! Also, I checked out the other thread linked in this one, about the shift computer....where exactly is it located?? In the back behind the removable panel? 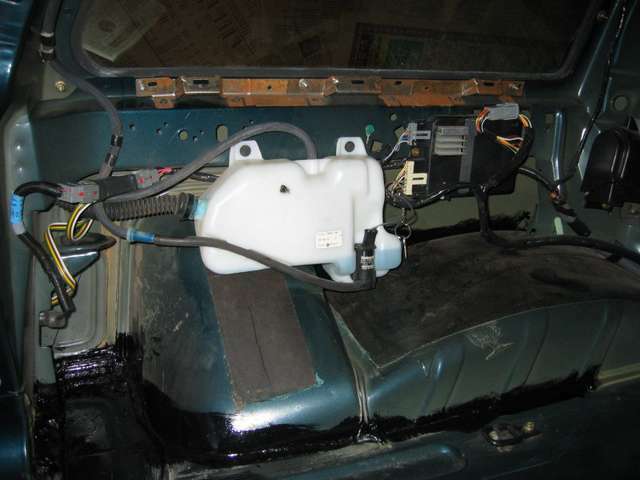 Where the jack and tire iron are, and the washer fluid reservoir?? Does it have 3 seperate harness connections (2 plug type and one hardwired)? Could it be easily mistaken for a factory amp and accidentally removed? And if so where can I get another one? Yes... You've chucked your 4x4 controller... Time to visist a boneyard for one. The 4x4 controller is the box to the right of the washer fluid reservoir in the first pic. The stock amp is located on the right side of the vehicle as seen in the 2nd picture. Update! I took my truck to a local 4x4 shop and had a guy take a look. He crawled underneath and had me engage 4x4 and rool forward and back. He said that my auto locking hubs were engaging and disengaging as they are supposed to. He said my front drive shaft is not turning via the transfer case. He recommended i take it to a Ford dealership and have them look at the solenoid. Any thoughts or comments are welcome here. Could the problem be the 4x4 computer in the back or is it definately in the transfer case? The above is not 100% clear. You wrote the hubs locked and unlocked correctly, but the T-case didn't turn the front drive shaft. This doesn't make sense (unless you mech manually rotated the shaft as in the testing procedure below). Your autohubs will only lock if the axle shaft is being powered. This would mean the front drive shaft is also turning, which means the T-Case must be correctly sending power to the front shaft. Crawl under your Explorer with the wheels on the ground and engine off. Rotate the front driveshaft in one direction. This will rotate the left and right axles which (after several rotations) will lock the hubs. When the hubs lock you will hear and feel a slight click. If the HUBS are working correctly you will NOT be able to rotate the front shaft anymore. If you can continually rotate the front driveshaft then the axle shaft the moves is the one with the broken HUB. Can I assume that this means you have replaced the 4WD computer? If you have a good computer in there and the t-case still won't shift, it's likely the shift motor. One comment on taking it to Ford (or most shops for this). If they determine the fault is the shift motor, they are going to sell you a new motor. "By the book" there's no such thing as cleaning/rebuilding the shift motor. ^^ I just performed the test on my hubs. With my engine off and the explorer in park, I crawled underneath and rotated the front driveshaft. It turned a few times then i heard some clicks and it wouldn't turn that direction anymore. I could rotate it the opposite direction a few times then it would stop. I assume this means my hubs are working properly. Are there anymore tests I can perform myself to determine what the problem is? If I was to locate my 4x4 computer what would I look for when i found it? IS there a fuse on it? Are you getting any noise from the transfer case when hitting the 4wd button? Did you ever search the threads concerning removal and cleaning of the tranfer case motor? That is the most common cause of 4x4 not engaging. Ok it appears your hubs are working.. When you press the 4x4 button what happens and what do you hear? Does the light next to the 4x4 dash button and 4x4 panel indicator light come on? Do you hear/feel the T-Case shift into 4x4? Its the shift motor, take it off, rebuild it according to the instruction on this and other sites and save yourself some cashola. Ford will sell you one for about $300, I have rebuilt 9 of them to date, all 9 still work perfectly as far as I know. Also once you have the shift motor off you can shift the transfer case by hand with pliers, just remember you must be in N to put it in low range. Thanks for all the help guys. I am definately going to take your advice and use the 4x4 at least once a month. I know the manual says not to use 4x4 on pavement, but is a few miles ok? a few miles in high range wont kill it, just dont turn sharp. the same thing happened on my '94 xlt, the problem was that the selenoid went bad and that is a simple fix, you could have simply gone to your local junk yard or used parts store and probably found the selenoid for about $45-$60. That's all i did and it works fine. Check out the "Rebuilding the 4WD Shift Motor," by Brain.. it is in the Useful Threads forum.